Who Sets the Hanukkah Table? “Who Sets the Table?” is a multimedia project looking at who does what to make Jewish holidays happen in our homes. Over the course of the year we have been running a series of surveys, reader stories and commissioned essays exploring this dynamic. So far we have asked you about Passover, the Sabbath and the High Holidays, and we have learned that, in all cases, Mom does most of the work. Lesbian, gay, bisexual and transgender homes tend to be more egalitarian than straight households, though nowhere close to 50-50. Now we are looking into who does what for the observance of Hanukkah. Who buys the potatoes? Grates and fries them? Invites the guests? Buys the presents? Teaches the children about the Maccabees? Explains the dreidel to them? The goal of this project is not, ultimately, about giving a prescription for how you should divide this work in your house. Instead, it’s a call to pay attention to the type of domestic and emotional labor that has long been overlooked and/or undervalued in our societies and homes. We invite all of you to take the survey below and share your stories about how you do this work. Based on our research from the previous “Who Sets the Table?” surveys, women have likely been the ones summoning the Hanukkah latkes into existence in many of our households for generations. Also, based on our research, modern women, many of whom now work outside the home, are kind of tired. 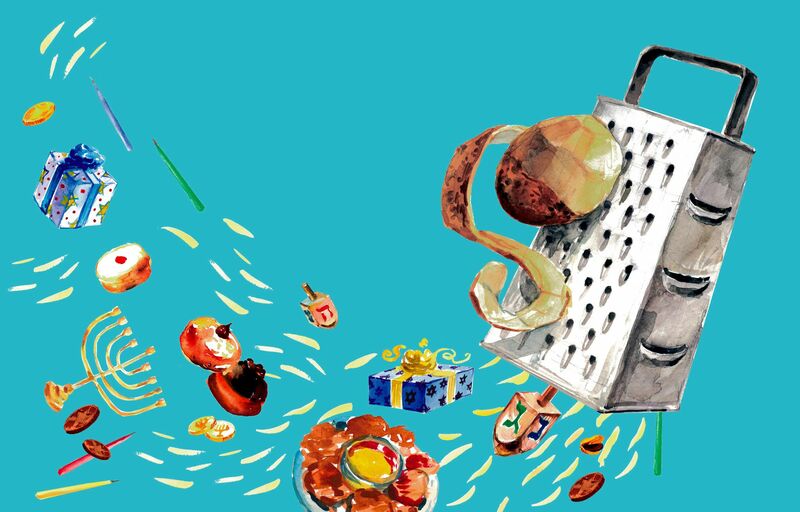 Because we are a people who have proved ourselves particularly adept at adapting, we thought you might be game to mix things up this year and have Dad man the frying pan as part of our #DadLatkeChallenge. (You can read more on that below.) Before you head off to your frying pans, though, check out the powerful essay by Forward contributor Laurel Snyder on what happened to her plans for an egalitarian marriage when she fell in love with a non-Jewish man. Wishing everyone a holiday filled with the miracle of light — perhaps reflecting off a pile of glistening latkes, courtesy of Dad. Happy Hanukkah!